Create metallic décor to brighten your kitchen! On a covered surface in a well-ventilated area, prop up craft foam letters at an angle using a cardboard box so that they are easier to spray. Always read the label for proper application and safety instructions prior to spray painting. Spray the letters with 2 coats of Krylon Craft Foam Primer and allow to cure for 48 hours before topcoating. Once completely cured, topcoat the letters with Krylon Premium Metallic in 18 Kt. Gold allow to dry completely. 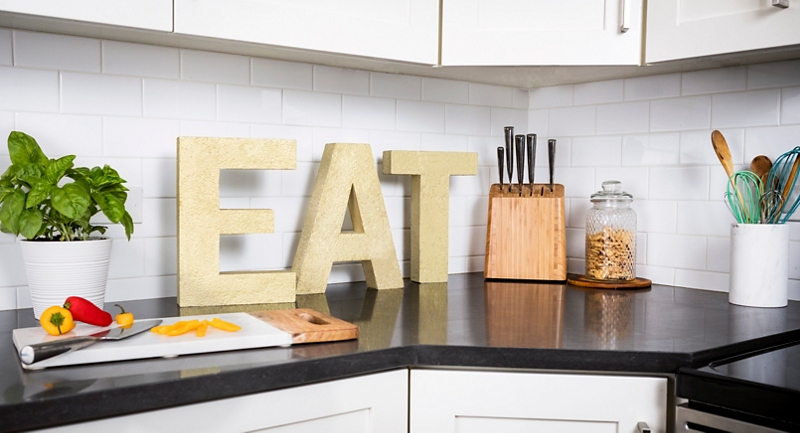 Once dry, use removable adhesive strips to hang letters on wall.